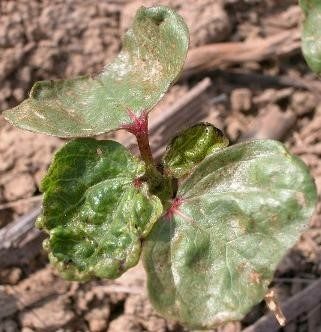 Should You Spray for Cotton Thrips? Cotton that received this amount of injury or less would likely not be worth a spray. Cotton that received this amount of injury would have benefited economically from a spray. At this point, a lot of the damage has already been done. What is the growth stage of the cotton? I cannot stress the importance of this point. Cotton is the most susceptible by far before the two-leaf stage and adults prefer to lay their eggs in cotton during these stages. 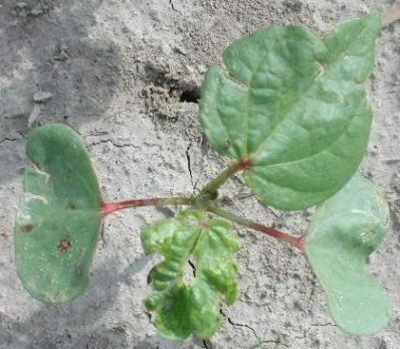 Cotton will take a yield hit up to the five leaf stage, but sprays at the four and five-leaf stage are typically for revenge, rather than yield. You can tank mix your insecticide with a post herbicide application. The decision you will likely make is whether to be timely for the weeds or the thrips. What are your thrips numbers? Our threshold is two nymphs per seedling at or before the first leaf stage. Note the importance of spraying your cotton early. Finally, the majority of fields in our state without imidacloprid in-furrow will greatly exceed the economic threshold, justifying sprays. When did you plant? On average, cotton planted after the 17 of May is safe from thrips. However, based on the Thrips Infestation Predictor for Cotton, cotton planted mid-May and later will be most at risk for thrips in 2018 throughout much of the state. This is because the two most critical factors for thrips injury in cotton are the “thrips flight” and how fast the cotton grows (cooler conditions mean slower grow off for the cotton). We had cool early spring conditions, with lots of rain that hampered thrips populations. These are recovering and are migrating into fields as winter hosts die off. Also keep in mind that pressure is relative. Cotton seedlings should be growing fast in this warm weather and we should have a lighter pressure year this year compared to the last two. Did you use imidacloprid in-furrow? Our recommendation for the past few years has been to use the highest labeled rate of imidacloprid (Admire Pro) in-furrow overtop of insecticide-treated seed. The rationale for this is that, when the imidacloprid was applied correctly in replicated tests, a foliar spray for thrips was not necessary. Even though thrips were first identified as neonicotinoid resistant in 2014, the cotton seemed to take up enough insecticide with this shot in the furrow to overcome the thrips. For a number of years, we have had failures with this combination due to resistance or poor application. For example, if the in-furrow application method is not correct (not applied directly in-furrow with good insecticide to seed contact), you will likely need to spray. It would be a good idea to scout all cotton, even acres with an insecticidal seed treatment and Admire in-furrow for these reasons.